Technology has made it easier than ever to reach audiences all over the world. It just takes is a little thinking outside the box and you can market a self-published book in creative, affordable, and impactful ways. Consider book tours! Tours are a great way to connect with your readers and technology has made them easier and more cost effective than ever! 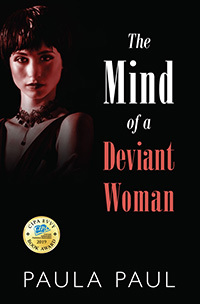 Author Paula Paul is taking her latest book The Mind of a Deviant Woman, on tour — a Virtual Book Tour with Outskirts Press. This will allow Paula to take her book into the far corners of the globe, all from the comfort of her own home! Keep an eye out for Paula’s book as she will be featured on several blogs over the weeks and months ahead! Luckily for us, Paula was kind enough to answer a few questions as the tour was getting started so that we can give you a sneak peek into the mind of the creator of The Mind of a Deviant Woman. OP: Tell us a little bit about The Mind of a Deviant Woman. What is it about? Paula: This is the story of Carrie Buck, a young woman in the 1920s targeted to be sterilized because she was considered a deviant for having a child out of wedlock. It is also the story of Louisa Van Patten, a young New York socialite, who like many intellectuals of the era, supports the movement known as eugenics that advocates sterilization of people who have been labeled deviants for a variety of reasons. The aim of the movement is to bring about a more perfect society. When Louisa meets Carrie as well as a Ben Newman, a journalist, her life veers off course in ways she never imagined. This is a work of fiction based on a true story. Paula: I was captivated by the story of Carrie Buck’s trial that resulted in a Supreme Court decision that made sterilization of so-called deviants legal. The court’s decision influenced the thinking and actions of Adolf Hitler. Paula: I submitted it to Outskirts Press. Paula: Readers who are interested in history, social movements, or simply a good story will be interested in this book. Paula: Carrie’s story, as far as I have been able to determine, has never been told in the form of a novel. It is also concerning a part of the American people’s history that few are aware of. Paula: The subject has never been explored in novel form, as far as I could determine, although a few non-fiction reports of the trial have been published. Also, the blend of real and fictitious characters makes it somewhat unique. Paula: Yes, I have published a total of 35 novels, five of which are for children, and four of which are ebooks. The rest are mysteries and general fiction published by major publishers. Paula: Yes, I have a book currently with my agent who is in the process of sending it to publishers. I have also started writing another book. OP: Thanks for your time, Paula! We look forward to learning more about you as you visit other bloggers! Paula Paul is an award-winning author of more than thirty novels. She is best known for her Dr. Alexandra Gladstone Mysteries and her literary novels, Crazy Quilt and Forgetting Tommie, both set in her native Texas. She has won a Willa Award, a Texas Institute of Letters Award, a National Press Women Award, and others for her novels. Before her career as a novelist, Paula was a journalist in Texas and New Mexico and received several state and national awards in that field. She lives in Albuquerque, New Mexico, with her two dogs, Alexandra Gladstone and Wolfgang Mozart.